Every time I read an album review effusing praise over how many different styles of music the artist managed to cram onto a single disc, or worse, into a single song, I make a mental note to avoid that record at all costs. I sometimes even find myself wondering if The Beatles were worth it. The greatest band ever? Probably. But they unleashed the pestilence of eclecticism on the world. The White Album, Sgt. Pepper’s and Abbey Road were all exercises in sustained aesthetic discontinuity, and it was because of the particular genius of The Beatles that they were able to assemble masterpieces out of so many disparate parts. Unfortunately, legions of bands not possessing that particular genius were thus exposed to the notion that great music could be made by juxtaposing sounds and styles in apparently random, illogical combinations. Scotland’s The Beta Band are devout followers of the “more is more” philosophy, and have demonstrated a singular determination to cram as many styles and references into their music as possible. So extreme is their eclecticism, it’s nearly impossible to know how to categorize the band (psychelectronica folk-hop perhaps, but then where do the funk bass lines come from?) except by calling them simply “eclectic.” But somehow, they make it work. Even more impressive, in Heroes To Zeroes they’ve put together a truly brilliant record, one in which all their genre-hopping mash-up tendencies not only make perfect sense, but really start to seem like the coolest possible way to make music. It’s almost like listening to The Beatles. Every track on Heroes To Zeroes sparkles with instrumental hooks—George Harrison’s guitar stabs, Stevie Wonder’s clavinet lines, Björk’s plinky harp sounds, and more. The record is a cornucopia of aural delights, constantly surprising in its inventiveness. And somehow it never feels too scattered, even though the band doesn’t tread the same sonic terrain twice. Against this constant activity, too strong a vocal personality would be overkill. Luckily, singer Stephen Mason seems to realize this intuitively, and keeps his profile carefully in check. It’s not that there aren’t plenty of vocals, or that they’re mixed especially low; it’s more that Mason, who has a lovely, pliable voice, sings with no personality (and I mean that as a compliment). His voice is almost always double or triple-tracked, or masked behind a filter, but even when it’s exposed, it is almost entirely without affectation. And it’s that absence of vocal personality that really makes the whole Beta Band sound work so perfectly. 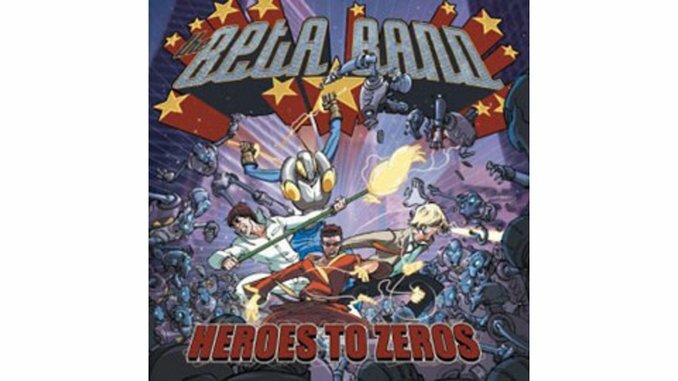 What’s truly fascinating about The Beta Band, though, is that it’s not just the vocals that are without artifice—it’s everything. Despite the many shifts in style and mood, there’s an emotional evenness to this record, a sublime way in which the whole project, while far from cold, sounds completely detached. It delights in referencing pop history, in the possibilities of sound, but with no sense of how sound connects with emotion. And yet, despite its self-estranged quality, this music isn’t just interesting or dazzling; it’s somehow, strangely, very moving.